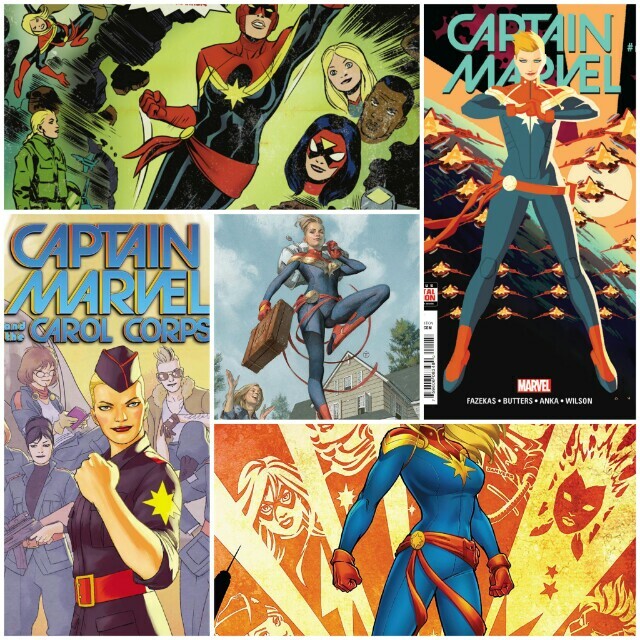 A compilation of various Captain Marvel comics released since the character's growth in popularity. First introduced as a supporting character in 1973, Captain Marvel now finds herself as one of the central members of the Avengers in the comics, as well as Marvel’s most prominent female character. The film seems to take inspiration from writer Kelly SueDeconnick’s 2012 relaunch on the character (the comics that propelled her to the front of the Marvel Universe, as well as the classic Kree-Skrull War story, wherein the two eponymous alien empires battle for control of the universe, and the Avengers find themselves in the crosshairs. Against all the odds, the Marvel Cinematic Universe (MCU) managed to transition from an up-and-coming movie series to the most popular media franchise in the history of mankind. That may sound like an over-exaggeration aimed to prop up the series. In all fairness, truth supports that statement: in terms of total revenue, the MCU does not even crack the top 10, as franchises like Pokemon, Hello Kitty, and Super Mario Bros. outgross the MCU by at least seven billion dollars. In terms of impact on pop culture, franchises like Star Wars and Harry Potter certainly matched or exceeded the MCU. However, regarding the impact on storytelling and especially the fandom in general, nothing even comes close to the MCU. In the case of the former, these films introduced fans and casual moviegoers to the idea of an interconnected cinematic universe, wherein each entry serves as both a complete tale in and of itself and a larger piece of the overall story. This formula proved successful enough for other franchises to replicate it, namely Universal’s Dark Universe and Disney’s own Star Wars anthology films, each to middling levels of success. The fandom created by the MCU, however, truly sets it apart from all other cinematic franchises. Centralized on social media sites like Tumblr, Instagram, and Twitter, these fans earned a reputation not only for propelling the series to break box-office records in droves but also for their unifying love of these films: examples of this include a dedicated fan watching Avengers: Infinity War over 40 times. In another case, an entire subreddit dedicated to the 2018 blockbuster banning half their members in an attempt to mimic the film’s ending. All in all, the MCU contains (unlike most other fanbases) a happy and unified fandom. However, that all seems set to change with the upcoming 21st entry in the MCU: Captain Marvel. Based on the adventures of the eponymous character, this 90s-set film (directed by Anna Boden and Ryan Fleck) will detail exactly how this lost Avenger became one of the most powerful heroes in the universe. Though that may seem like fairly standard fare for the MCU, the film actually finds itself the most divisive film in the MCU, as well as one of pop-culture’s most controversial entries on par with 2016’s Ghostbusters and 2017’s Star Wars: The Last Jedi. No examination of Captain Marvel can occur without looking at lead actress Brie Larson herself and her possible role in this situation. Starting her career in projects like The WB’s Raising Dad and 2006’s Hoot, Larson earned her breakout role as troubled teen Kate Gregson in Showtime’s United States of Tara. This led her to star in projects like Scott Pilgrim vs. the World, 21 Jump Street, and Room (the film that landed her an Oscar for Best Actress). Most of the controversy revolving around Larson tends to revolve around her beliefs and the expression thereof. Looking at the former, Larson presents herself as a noted feminist and activist, fighting for causes like gender equality and protection for sexual assault survivors. As for the latter, her first brush with social media occurred at the 88th Oscars, wherein she opted not to clap when presenting Casey Affleck with his Best Actor Award, due to allegations of sexual assault against him. This story generated a fair share of buzz after the fact, with media outlets praising Larson for her bold stance on the matter, as well as bringing to light the plight of sexual assault in Hollywood. Her advocacy truly caused a fuss, however, during a speech at the 2018 Women in Film Awards, where she called for more diversity in the field of film criticism; more specifically, she posited the claim that “[I] don’t need a 40-year-old white dude to tell me what didn’t work about A Wrinkle in Time”, as “it wasn’t made for him!” Though obviously a well-intentioned statement, the fractured state of American politics and how it impacted popular entertainment meant that her claims would instantly cause division in the fandom. 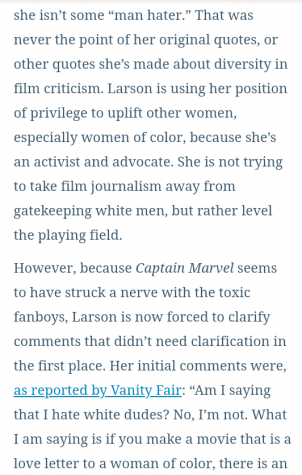 An excerpt of an article from The Mary Sue pop culture website, arguing in favor of Brie Larson’s statements about diversity in film review. Written by author Kate Gardner, the article specifically how none of Larson’s original statements implied a hate for white men, and that her words ended up twisted to fit that narrative; some accused the site of lumping all negative reviewers of the film as men, arguing that the quality of the film exists independent of factors like gender. Most notably, a contingent of fans called out Larson for a desire to exclude white men from covering Captain Marvel, as she notably chose to hire a disabled woman of color to interview her; she later clarified her statement as not intending to disparage white males, and instead explained how “I’m looking…to bring more seats…to the table”. Seeking to push back against the criticism faced by Larson, writer Kate Gardner of The Mary Sue argued Larson needed to clarify herself, as nothing she said even indicated hate. The actress also faced criticism for using the film and her role therein to motivate votes in the 2018 midterms. Finally, Larson earned more detractors for an Instagram post in memory of the late Stan Lee. Taken the day after his death, the picture depicts Larson in a cafe of sorts holding up a drink, with her name displayed on an embroidered bag. Fans criticized the post as disrespectful to Lee’s legacy and Larson as “vapid” and “out-of-touch”. On to the title character herself, Captain Marvel (real name Carol Danvers) first debuted as an air force officer in 1968’s Marvel Super-Heroes #13. Introduced as a supporting character to Kree hero Mar-Vell (who also used the title of Captain Marvel), she later became her own hero in 1977’s Ms. Marvel #1 and led her own solo title for years before becoming a member of the Avengers. In 2012, she became a far larger part of the Marvel Universe when writer Kelly Sue DeConnick took on the duty of writing the character. Ever since, Marvel strived to make her the publisher’s definitive female character, on par with DC’s Wonder Woman. Ever since, though, a fair contingent of fans argued taking the character in a more feminist direction not only harmed the character herself (since 2012 her solo title relaunched five different times) but also the entire comic branch of Marvel. With all this said, fan reaction needs an examination. The first sign of fan division emerged with the first trailer for the film: while innocuous in and of itself, the issue arose when complaints of Larson seeming disinterested and unhappy, citing a lack of smiling as the main issue; this lead a pocket of fans to photoshop smiles onto Larson. This lead other fans to call out the first group as sexist and argue the trailer purposefully made Danvers out as serious. Brie Larson herself entered the conversation when she shared photoshopped posters featuring Doctor Strange, Iron Man, and Captain America to depict them smiling, so as to highlight double standards. Another source of controversy that arises deals with the power of the character: Marvel Studios producer Kevin Feige declared Captain Marvel years ago as the MCU’s strongest hero, and her movie would explain the source of this power. This also caused division among MCU fans, with certain fans happy that a woman could possess power exceeding other MCU characters. On the other hand, others argued that introducing such a character without building up to their power produces a Mary Sue character, a term coined by Star Trek fanfiction and popularized by Rey in the new Star Wars films. The Want to See score for Captain Marvel, after the ability to give such a score ended up revoked. Prior to the ban, average Want to See score for the film came in at a paltry 27%; many on Rotten Tomatoes’ staff, as well as some in the entertainment industry, accused internet trolls of trying to sabotage the film due to disdain for a powerful female character, claims also made around the release of 2016’s Ghostbusters and 2017’s Star Wars: The Last Jedi. The division reached a head just before its release, and the film faced massive review bombs on Rotten Tomatoes. While not a new trend, certainly, the ones faced by Captain Marvel marked the first time Rotten Tomatoes themselves responded. In the latter case, RT’s staff modified the site’s algorithm so that only after a film releases could users write reviews. This decision not only led to fan outcry but motivated the initial review bombers to move onto sites like IMDb. As a result of this, writers from The Mary Sue website brought up the idea that mostly men dole out negative reviews, a statement that drew the ire of certain fans. In summary, the fan division regarding Captain Marvel, regardless of where one falls in the divide, should worry all Marvel fans. After ten years of non-stop success, anything causing even the slightest bit of outcry could cause major ramifications. Perhaps the feminist marketing turns off a large number of “toxic viewers” as opposed to diversity in media-then the upcoming Eternals film will simply repeat the dilemma of the present, or maybe the presence of any political views in this story lacks appeal to casual moviegoers- then the increasing political elements of the films likely already alienated them. Regardless of what Marvel chooses to do, one objective seems clear: minimize all division among fans. This story was originally published on The Chant on March 12, 2019.